In 1995, I was diagnosed with cancer when I was four months pregnant. It was during that stressful time, I discovered art offered an escape from my fear and anxiety. I brought that memory with me when I went to work as an Artist in Residence on the oncology floor of a Children’s Hospital. There, I witnessed hundreds of people, in very stressful circumstances, get lost in the world of their imaginations. It’s in this meditative, healing, creative, flow state, where time and space no longer exists, that I saw people transformed. I am passionate about sharing what I've learned about the art & healing connection and I've made it her mission to help as many people as possible with that knowledge. I create artwork, meant to uplift and inspire. My "Mindful Mandala Meditations" adult coloring book is an easy to use tool help people access their creativity. I am the author and illustrator of several children's books, my paintings can be found in medical facilities, corporate spaces and homes. I've licensed my art to major retailers and my children’s art has been published in books, annuals and magazines. I was also a muralist for the TV show, Extreme Makeover Home Edition, Powell family episode. 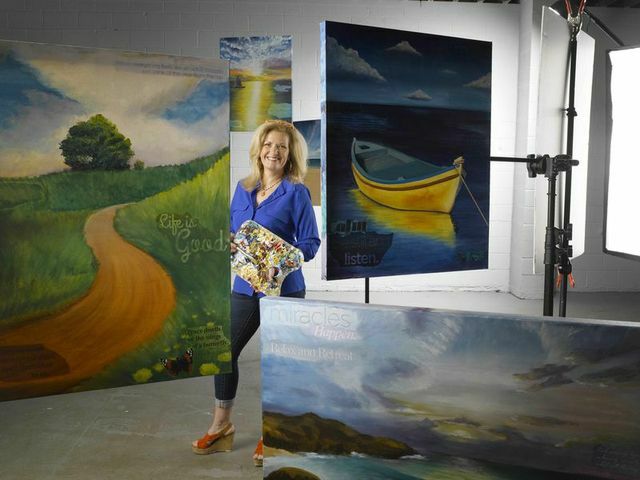 Colleen Wall Darby is an artist and nationally recognized creativity expert. Through her art, coaching and hands-on workshops, she helps people access their inner creative genius, by using the power of their imaginations.